The majority of UK architects plan to vote for the Labour Party in tomorrow's general election, according to research from industry magazine The Architects' Journal. A report published today on the magazine's website suggests that the political party led by Jeremy Corbyn is significantly more popular with architects than Theresa May's Conservative Party, which is currently in power. 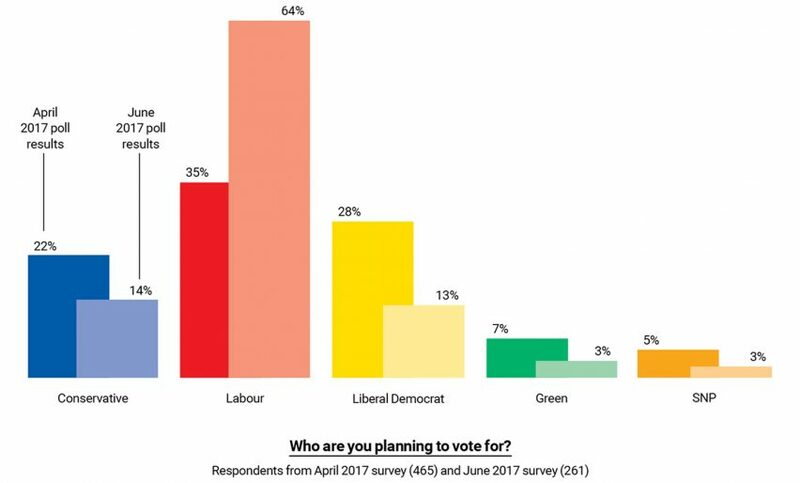 Of the 261 architects, students and architectural technologists surveyed, 64 per cent said they intend to vote for Labour in the nationwide ballot, versus 14 per cent who plan to select the Tories. The results reveal a noticeable shift from the poll the Architects' Journal (AJ) conducted two months earlier, which also put Labour ahead of the Tories, but by only 13 per cent. It is possible that the party election manifestoes may have influenced this shift – as these were all released between the two polls. Labour's manifesto included a separate 12-page document dedicated to architecture and design, highlighting many of the concerns outlined in Dezeen's Brexit Design Manifesto. It may have been this that led 60 per cent of AJ's respondents to claim that Labour understands the needs of the architecture industry better than any other party. The Conservative Party only briefly mentions the creative industries in its own manifesto, although it did previously promise to put the sector at the heart of its plans to revive UK industry, particularly when the country leaves the European Union. Conservative prime minister Theresa May called the snap election ahead of the start of Brexit negotiations, to determine which party will oversee the UK's departure from the European Union. Tory election pledges include offering a creative industries tax relief scheme and the protection of intellectual property rights. It also proposes new technical qualifications known as T-levels. Labour also pledges to support intellectual property rights. Additionally, it plans to put more creative subjects on the school syllabus, pump funding into school arts facilities, and offer lower levels of corporation taxation for small businesses.